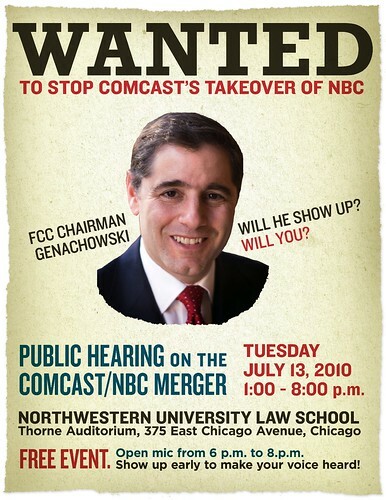 Photo from Free Press, which is pushing people to attend a public hearing in Chicago on July 13th on the Comcast-NBC merger and is opposed to the merger. Congressman Bobby Rush (D-IL) put together a hearing on the possible merger of Comcast and NBC Universal on July 8th, which was held in Chicago at the Everett Dirksen Federal Building (the same building holding the US v. Blagojevich proceedings). The hearing, held by the Subcommittee on Communications, Technology and the Internet (a subcommittee of the Committee on Energy & Commerce in the House of Representatives), invited "witnesses" to testify and provide insight into who might benefit from the merge if it went through. The hearing held was not open to public comments. 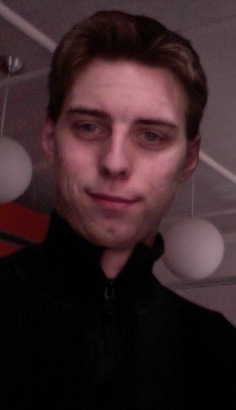 However, Rep. Rush, Rep. Rick Boucher (D-VA), Rep. Maxine Waters (D-CA) and Rep. Steve Buyer (R-IN) asked questions of all the invited witnesses after an hour of opening statements. The witnesses present included: Samuel R. DeSimone, Jr., General Counsel, Earthlink, Inc; Will Griffin, President and Chief Executive Officer, Hip Hop on Demand, Jonathan Jackson, National Spokesman, Rainbow/PUSH Coalition, Inc.; Paula Madison, Executive Vice President, Chief Diversity Officer, NBC Universal; Joseph W. Waz, Jr., Senior Vice President, External Affairs and Public Policy Counsel, Comcast Corporation. (Ms. Shirley Franklin, Senior Adviser for the Alliance for Digital Equality was invited but did not attend the hearing). Initially, it appeared the merger would be framed as a debate about how it would impact consumers. The opening statements from representatives at the hearing highlighted how the merger could eliminate competition and limit choices in the marketplace. The statements made note of the fact that Comcast is "the nation's largest video programming distributor, the largest residential broadband provider, and the third-largest home telephone service provider" as well as the fact that, "as measured by annual revenue, NBC is the fourth-largest media and entertainment company." The opportunity for a discussion of media consolidation presented itself. So, instead of discussion on media consolidation, what emerged as the core of discussion and the wrapping that this merger would be packaged in so policy makers, industry representatives, concerned citizens and others would accept it was diversity. This was how it was framed and it became increasingly clear that Comcast and NBC Universal had been asked to make commitments to diversity by representatives if they wanted to get a merger deal and if they wanted representatives in Congress to work with them and make this merger happen without FCC or Department of Justice interference.